George Graham Reviews Nickel Creek's "Why Should the Fire Die?" Nickel Creek : Why Should the Fire Die? Ever since the end of the 1970s, creative artists have been pushing the boundaries of acoustic music, starting with New Grass Revival and David Grisman, which helped to inspire the whole New Acoustic music scene, which continues to be active. It has helped to redefine acoustic music and widen the horizons of bluegrass to be more welcoming of original music, as well as to provide a fertile ground for the mixing of genres, such as bluegrass and jazz, and even bluegrass and reggae. By now, the pioneers of New Acoustic music who were young instrumental iconoclasts a quarter century ago, have become the established masters in the field, and have helped to pave the way for a further generation of players who are building on their groundwork to create another evolution of acoustic music. At the heart of the new New Acoustic scene are the popular Alison Kruass and Union Station, and Nickel Creek. Nickel Creek have just released their third, or fourth CD depending on how you count them, called Why Should the Fire Die? The members of Nickel Creek are still quite young, in their mid 20s, and have been playing together pretty much since childhood in California. Fiddler Sara Watkins and guitarist Sean Watkins are siblings, and mandolinist Chris Thile has been a neighbor and played bluegrass with the Watkinses as they were growing up. All three were attracting attention at a young age, with Sara Watkins winning the Arizona State fiddle championship at age 15. Sean Watkins won the national flatpicking championship at age 16, and Chris Thile had released two CDs, one at age 13, before the debut of Nickel Creek. Thile was just 19 when Nickel Creek's eponymous CD first appeared. Though they put together an independent CD in 1997, their first national release, called Nickel Creek, featured Chris Thile's father on bass, and it was produced by Alison Krauss. Since then, the band has constantly evolving in style, pretty much abandoning playing traditional bluegrass to explore fascinating mixtures of styles. Thile sums up their current approach by saying "If we're going to blend genres, we'd like it to be genre soup, where you can't see what's in it -- as opposed to genre stew, where everything is very defined." Their writing is also very un-bluegrass-like, with often a rock level of energy, sudden shifts in direction, texture and dynamics, and lyrics that are more like rock tunes. The sound follows in the footsteps of Chris Thile's most recent solo album Deceiver, released last year. And if asked to come up with some kind of typical music-critic catch phrase, I would call it "art-grass," a kind of acoustic equivalent of art rock, and usually light years from standard bluegrass fare. For this CD, the core trio is joined by bassist Mark Schatz, who spans the generations of New Acoustic players, having played on David Grisman recordings in the early 1980s, and was also a part of Béla Fleck's first solo album in around the same time. Traditional bluegrass songs tend to be about homesickness, or missing one's lover, or some tragedy or another. Nickel Creek's lyrics on this album do tend to be sad, though in a rather different way, with several song essentially being about breakups in one form or another. While all of the Nickel Creekers are real virtuosos, there is less flashy individual picking on this CD, in favor or more ensemble material, and the exploration of instrumental textures, often giving a rock edge to the music. They also experiment some with distorting the sounds of the instruments and even vocals, but it's generally well-handled, demonstrating a lot of imagination and considerable precision in their playing of the complex arrangements. 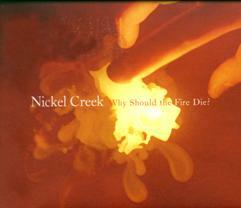 Nickel Creek may use a fiddle, mandolin and guitar, but their new, third CD Why Should the Fire Die? is hardly a conventional bluegrass album. This remarkably creative acoustic group have brought the phenomenon of New Acoustic music very much into the 21st Century, borrowing as they do from everything from traditional Appalachian to alternative rock. Their instrumental virtuosity has always been impressive, and now on this new CD, their musical vision in composing and arranging takes precedence, with lots of interesting new, original material, and arrangements with the complexity evoking the art rock of the past. Our sonic grade is about an A-minus. The band said they recorded the CD on vintage analog equipment, and one can hear evidence of tape saturation, which occasionally causes a little distortion, and gives an in-your-face quality to the recording, even though the dynamic range is fairly respectable by contemporary standards. I would also have used less of the special effects, that mutate the sounds of both vocals and instrumentation here and there. The sequencing of the tracks is nicely done, and when the mood changes drastically from one track to the next, the pause between songs is extended by a few seconds. Strict purist fans of traditional bluegrass will probably have much to quibble about if they think that Nickel Creek's new CD is supposed to be bluegrass. Traditional it definitely is not, but the band proves itself to be a very creative and musically impressive ensemble, regardless of genre. The band may well find its audience growing even more among open-minded rock and alternative aficianados who might never consider themselves bluegrass fans.